Spain’s premier data collection company and part of the Schlesinger Group. BDI Research, formerly Block de Ideas, is delighted to have recently become a Schlesinger company. We are a leading provider of research services across Spain, with a focus on the two key research markets of Barcelona and Madrid. For twenty-five years we have been delivering full-service qualitative and quantitative fieldwork services and we offer the following methodologies with the flexibility of multi-methodology studies where required. BDI Research specializes in taking care of international clients and our bilingual team has a genuine understanding of your international expectations including accommodating time zone and public holiday variances. BDI Research is certified in ISO 9001 Quality Management Standard and ISO 20252 Market Research Business & Quality Standard as part of our commitment to delivering the highest quality research services. Our proven standards of discipline and transparency in our management and data collection processes are the highest in the industry. For our clients this means a high level of confidence that you can rely on our quality from proposal, sampling and project management through to data delivery and feedback. We recruit for and diligently manage any kind of market research study, including focus groups, ethnographies, telephone interviews, a range of online qualitative methods and quantitative studies. Our recruitment markets include, healthcare, consumer, automotive, IT and business-to-business. BDI Research places your studies in our two unique facilities in Barcelona and Madrid; and in our partner research facilities across Spain. We offer the following methodologies with the flexibility of hybrid solutions, in sequence or in parallel. BDI Research was founded by Rosa Dalet in 1992 and, rapidly became a trusted choice for data collection and research services in Spain. 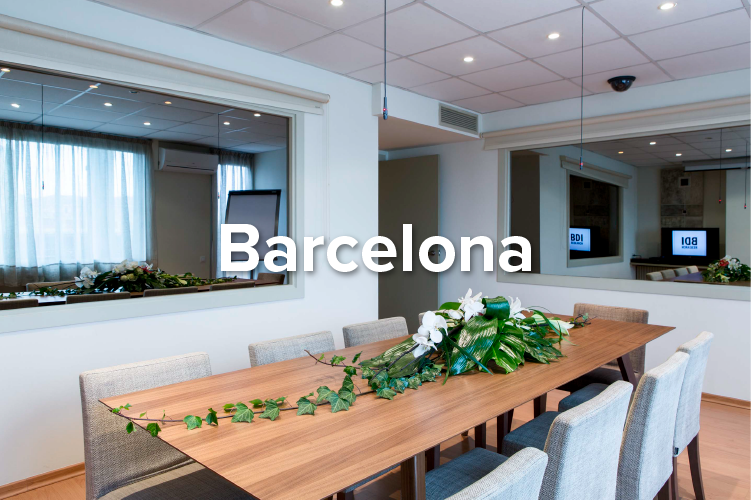 In 2002, building on its success, BDI opened its first focus group facility in Barcelona followed by Madrid, in 2005. In 2006, Schlesinger Group chose BDI to support their client research needs in Spain and a long-standing and trusted partnership was formed. In 2017, BDI Research officially joined the Schlesinger Group. Under Rosa’s continued direction, and through its client-centric approach, BDI Research continues to deliver outstanding solutions for its clients in Spain and worldwide. The acquisition by the Schlesinger family has allowed for extremely effective and positive merge of dynamic and talented international teams. We have already learned a great deal from each other. Our clients now benefit from the collaboration, resources, population access, partnerships and early adoption of innovative technologies that come with being part of Schlesinger Group. Wir organisieren Ihre qualitative Studie weltweit.